Mar 15, 2005 The First Cy-Boar Story from 1989! Mar 16, 2005 The First Cy-Boar Story from 1989! Mar 17, 2005 The First Cy-Boar Story from 1989! Mar 22, 2005 The First Cy-Boar Story from 1989! Mar 23, 2005 The First Cy-Boar Story from 1989! Mar 24, 2005 The First Cy-Boar Story from 1989! Mar 31, 2005 The First Cy-Boar Story from 1989! Apr 01, 2005 The First Cy-Boar Story from 1989! Apr 07, 2005 The First Cy-Boar Story from 1989! Apr 08, 2005 The First Cy-Boar Story from 1989! Apr 14, 2005 The First Cy-Boar Story from 1989! 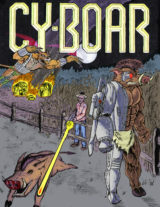 Apr 15, 2005 The First Cy-Boar Story from 1989! Apr 21, 2005 The First Cy-Boar Story from 1989! Apr 22, 2005 The First Cy-Boar Story from 1989! Apr 28, 2005 The First Cy-Boar Story from 1989! Apr 29, 2005 The First Cy-Boar Story from 1989! 267 queries. 36 mb Memory usage. 0.556 seconds.